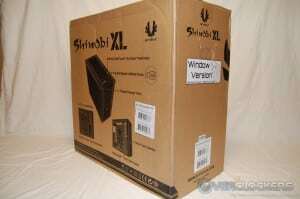 Looking to expand (literally) on the original Mid-Tower Shinobi, BitFenix has introduced the Shinobi XL. 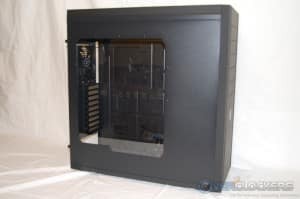 The XL version now supports E-ATX and XL-ATX form factor motherboards, promises to be water cooling friendly, and makes the leap to Full-Tower status. 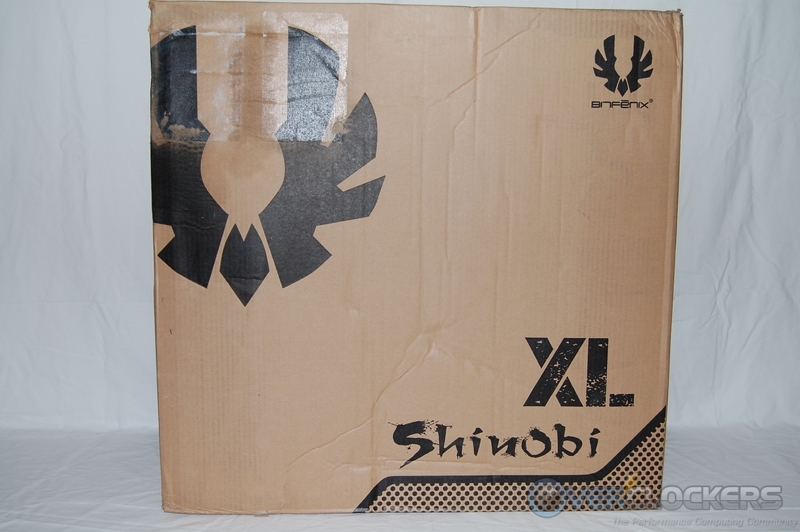 The Shinobi XL box does not have a bunch of flashy graphics, but the simple cardboard with black print gets the job done. 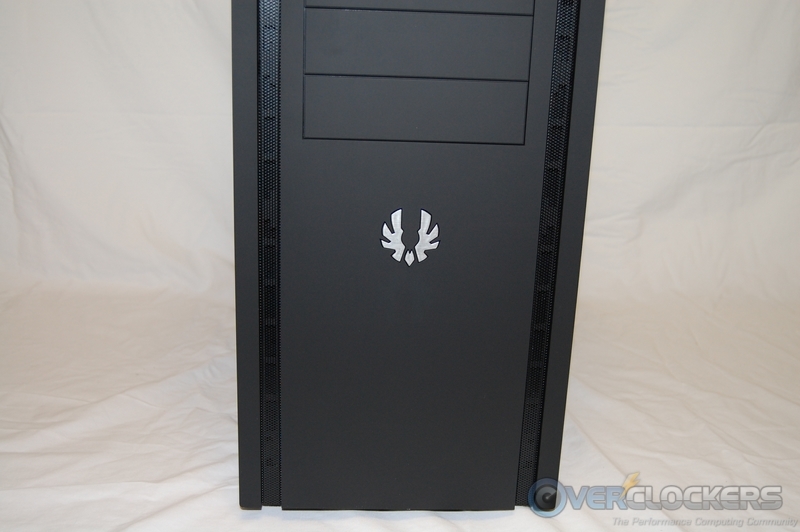 Printed on the box are BitFenix logos, Shinobi XL branding, and a few of the major features. There are also a couple of stickers applied to the box letting you know the “Window Version” is what’s inside. 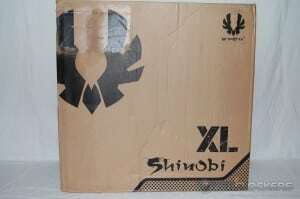 Opening the box top, we can see the Shinobi XL securely encased in Styrofoam blocks and wrapped in the customary plastic bag. Once removed from the box, you’ll find the users manual tucked in one of the sides. 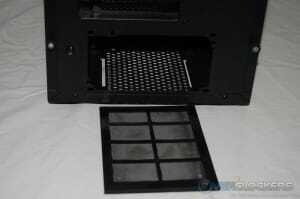 Applied to the plexiglass window is a plastic film to further protect it from scratches during transit. Included in the accessories are a 5.25″ to 3.5″ drive bay adapter, several wire ties, five adhesive cable clamps, a system speaker, and finally, a bag of assorted screws. If you look at the bag of screws closely, you will see a thumb screw looking piece. 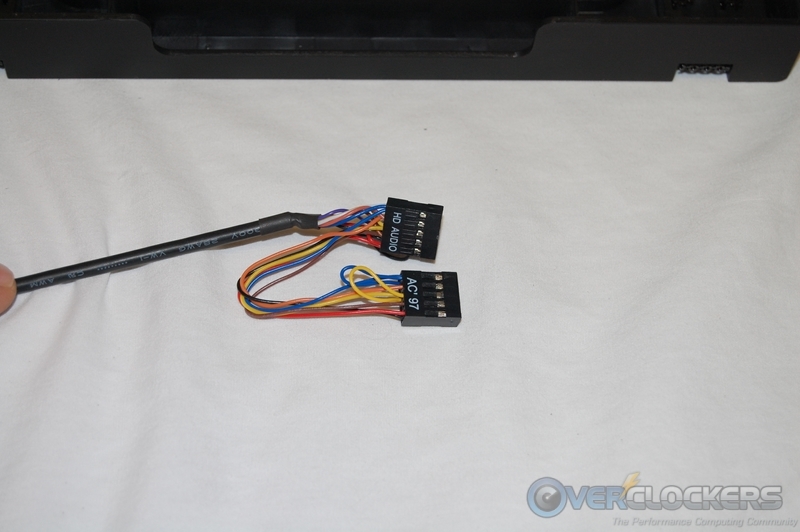 This is actually a socket that fits over the motherboard standoffs and can be used to install or remove the standoffs easily; nice touch there! 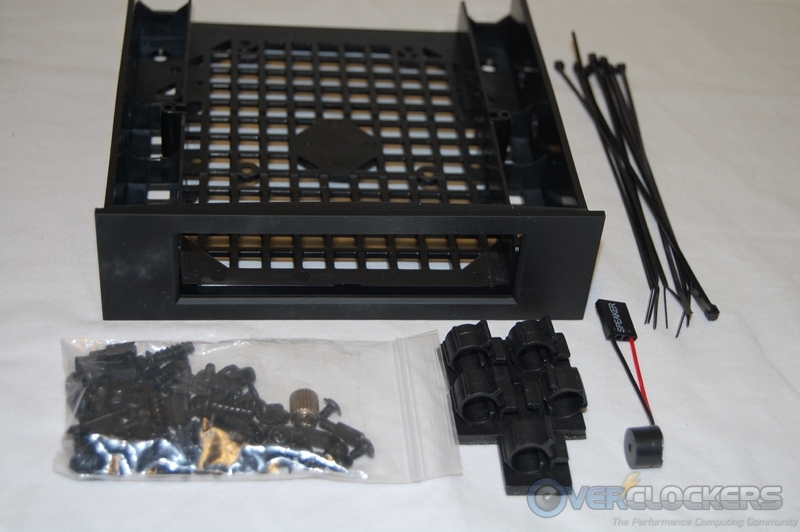 All of the accessories were in a box and wire tied to the interior of the case, except for the drive bay adapter. This was unprotected and loosely attached inside the case. If the accessory box was a tad bigger, the drive bay adapter could have been included and properly protected. In my opinion, the overall appearance of the Shinobi XL can best be described as classic and elegant. The marketing slogan associated with the Shinobi XL proclaims “Bigger, Badder, Deadlier.” I’ll go along with the bigger part; but, the “Badder” and “Deadlier” part, not so much. This is not to say the looks are unappealing, but perhaps overstated a little. 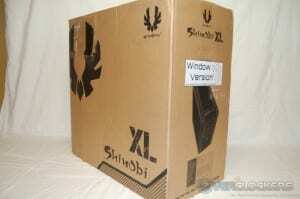 If you’re the type that likes clean lines and a classic look, you will definitely like the design of the Shinobi XL. 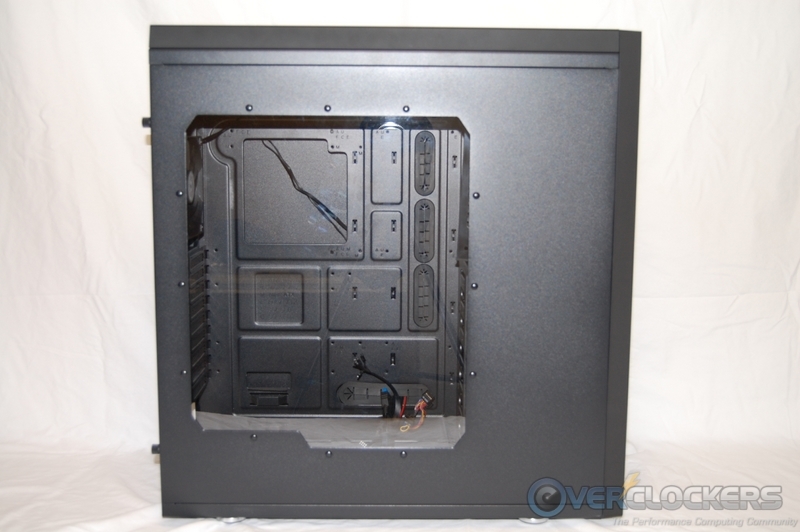 The left side of the case has a very large window that allows you to show off all of your interior work when the system is assembled. 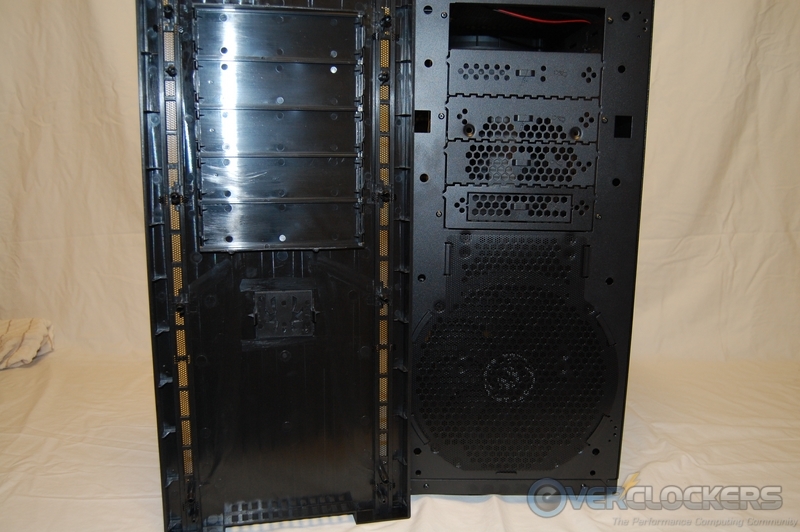 The right side panel is void of any design features, but much like the left panel, is constructed of a heavy enough metal to be very sturdy. 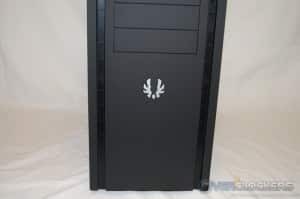 The front of the Shinobi XL features the “Soft Touch Surface Treatment” and a BitFenix appliqué attached to the bottom area. Unfortunately, there is little in the way of ventilation. 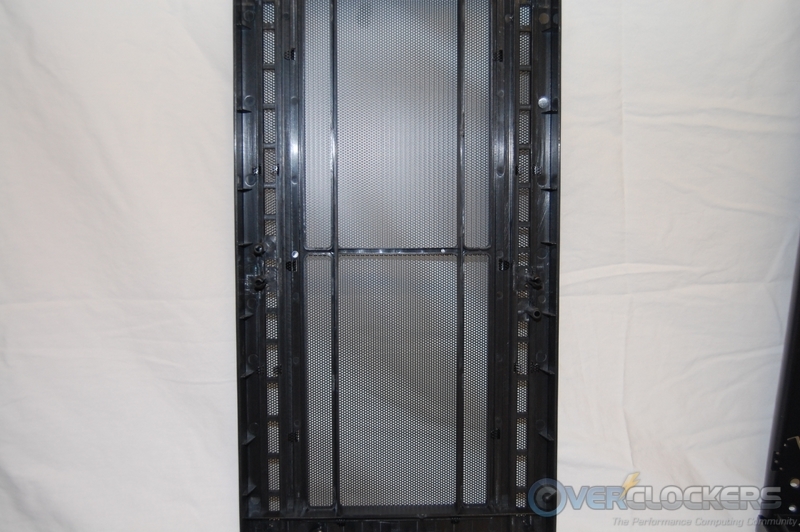 The entire front panel airflow is limited to two 1/2 inch mesh stripes running vertically down the length of the panel and a small opening at the base of the front panel. The included 230 mm fan behind the panel should be able to draw enough air to work adequately; but, if you take advantage of the accommodations made for a radiator here, I’m afraid the front panel airflow design is woefully inadequate. This will hold especially true if you use all the available space, and install a 360 mm radiator with fans. 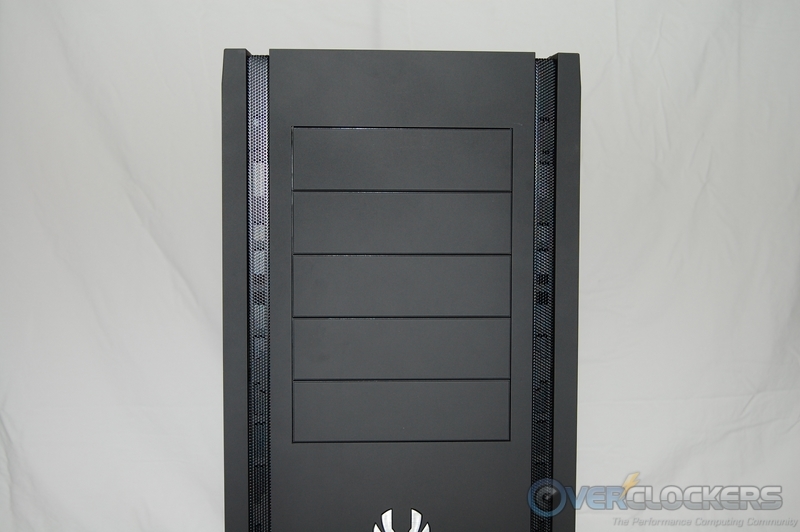 There are five 5.25″ external drive bays available, any of which can be converted to a 3.5″ by using the included drive bay adapter. 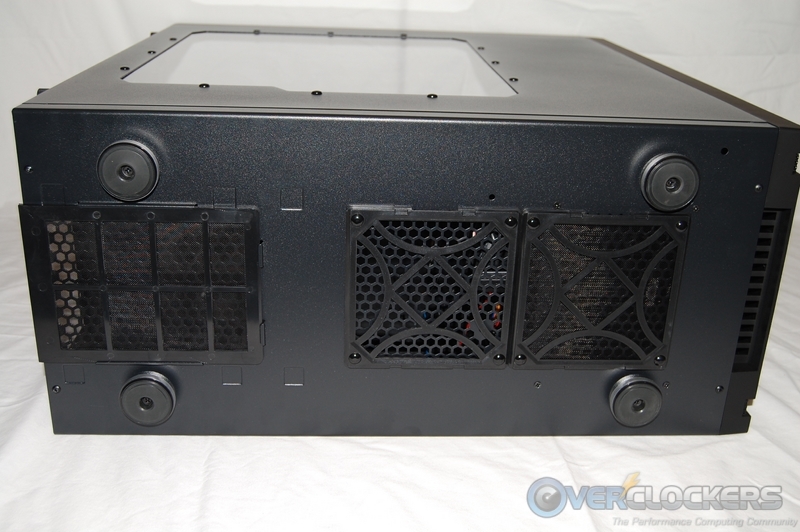 Moving around to the back of the Shinobi XL, we find the opening for a bottom-mount power supply and nine ventilated PCI expansion slot covers. 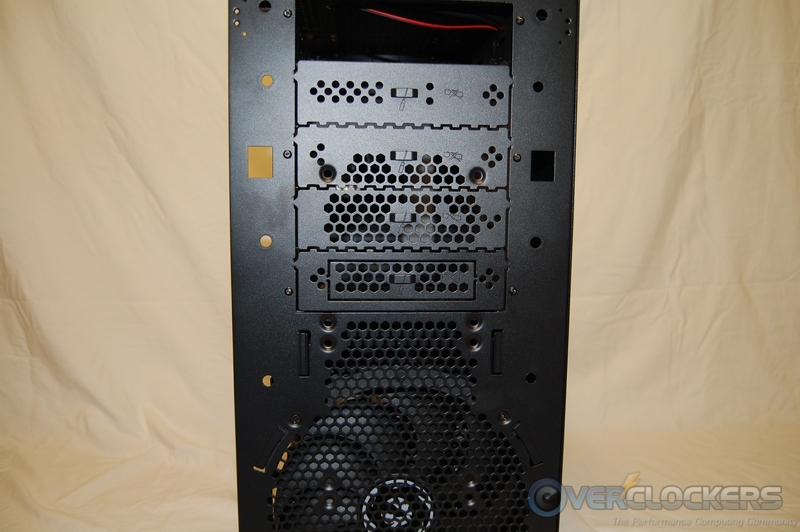 Underneath the power supply mounting area, there is a convenient slide-out filter to protect the PSU’s intake fan from dust. 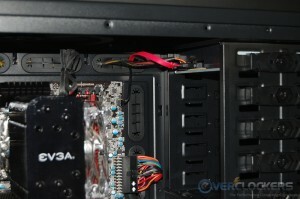 Noticeably missing from the area adjacent to the PCI expansion slots is any form of additional ventilation. 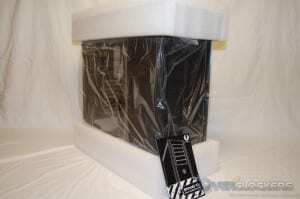 Most manufactures will ventilate this area to provide an additional escape route for heat generated by video cards. 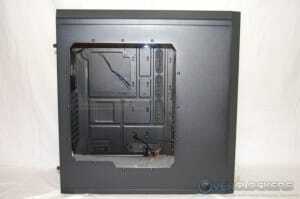 The upper section has an included 120 mm exhaust fan and is drilled to accept a 140 mm fan, if desired. 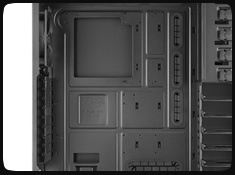 The opening for the motherboard’s I/O shield and the four holes for water cooling tubes round out the features at the back of the case. 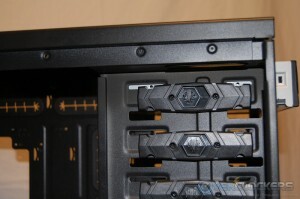 The four thumb screws holding the two side panels in place are metal with a plastic outer shell; kind of unique and work well. The top panel includes a mesh area running the entire length and has an included 230 mm fan under the rear most section. 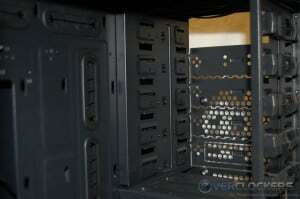 The areas that are not meshed have been treated with the “Soft Touch Surface”, just like the front panel. 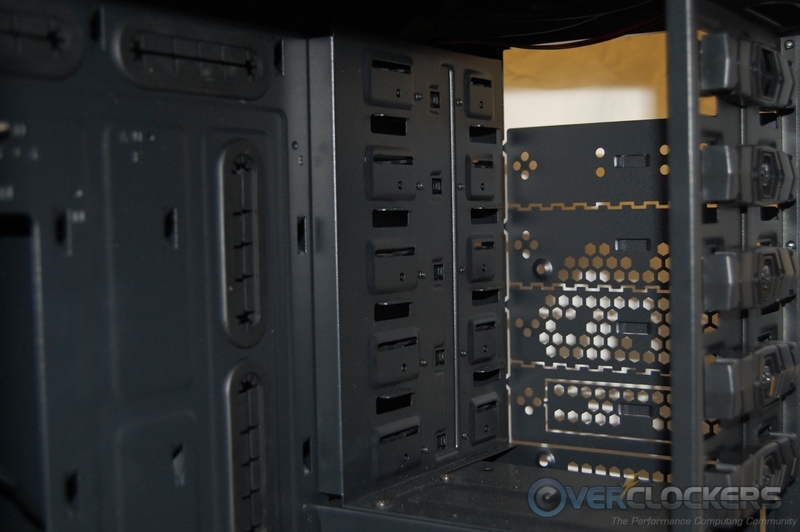 The 1/2 inch wide ventilation strips used on the front panel are also incorporated into the design of the top panel, which blend in nicely with the overall design. 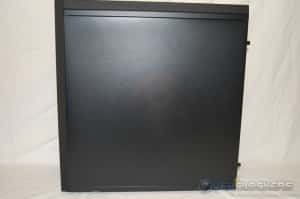 The forward area of the top panel features four USB 3.0 connections, the power and reset buttons, and the headphone and MIC jacks. 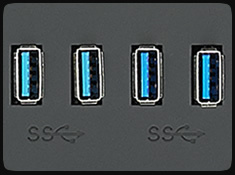 On the far left is a unique “Supercharge” USB port, which can provide 2.5 amps of current to rapidly charge portable devices. 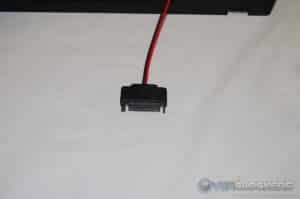 There is no data cable attached to the “Supercharge” port, therefore it can not be used for data transfers. 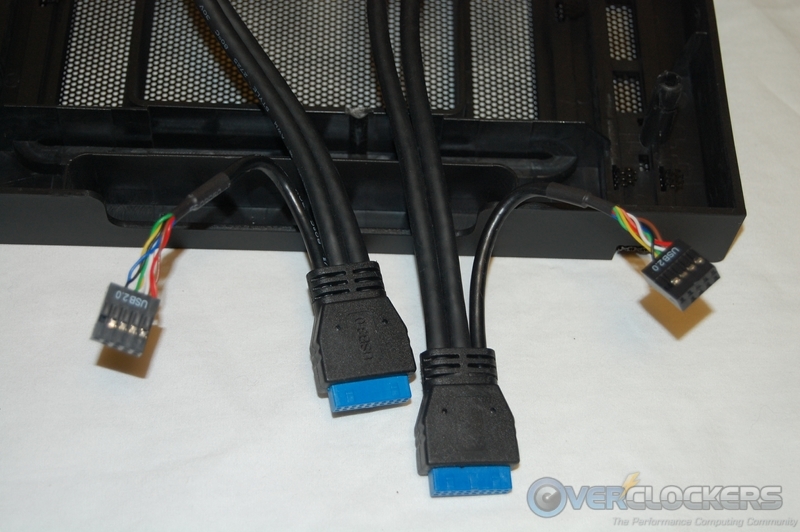 Attached to the “Supercharge” port is a power cable that gets connected to a SATA power connector. Having a look at the bottom of the Shinobi XL, we can see that provisions have been made to install two additional 120 mm fans. 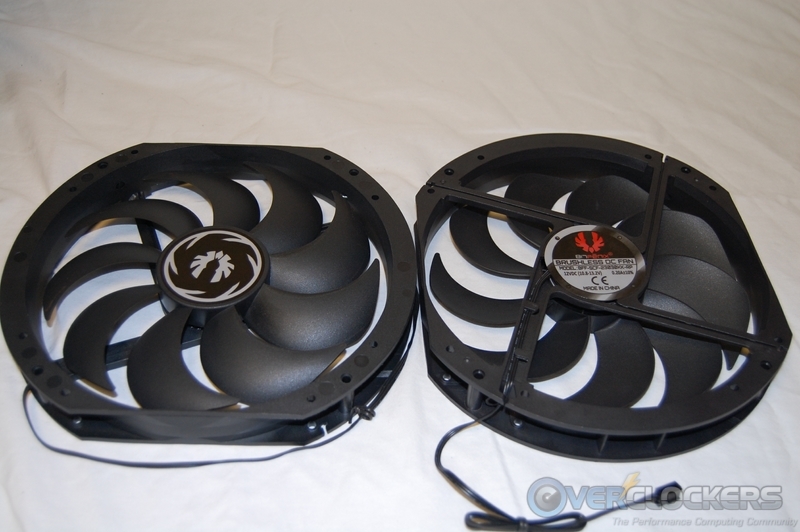 These two additional fans are supposed to be protected by a dust filter, but one was missing the actual filter element. Hello? Quality Control? 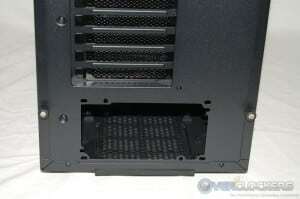 In addition to the slide-out filter we previously mentioned, there are four round, rubber feet. 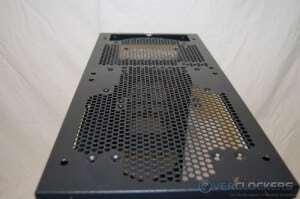 I like it when case manufacturers incorporate rubber inserts into the design of a chassis’ footprint. 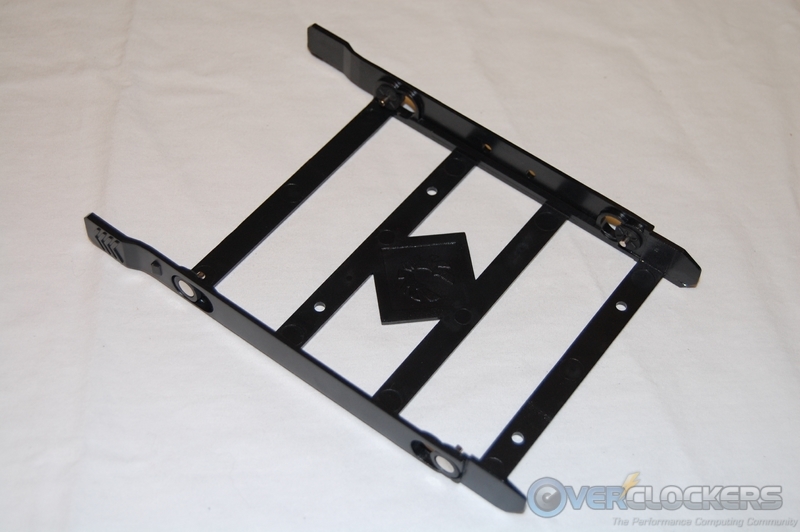 The use of the rubber feet protects any surface you may have the system resting on and provides anti-vibration qualities. 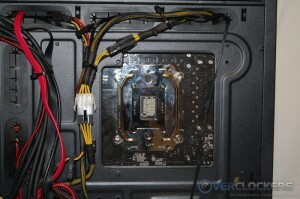 Removing the front panel exposes the bottom front intake fan and the filter that protects it. 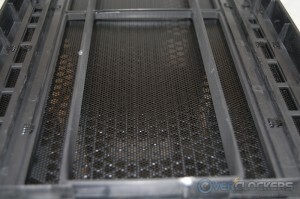 The filter is made of a metal mesh and should do an adequate job of catching most of the dust. Moving upwards along the front, we find a very interesting use of the drive bay punch-out covers. 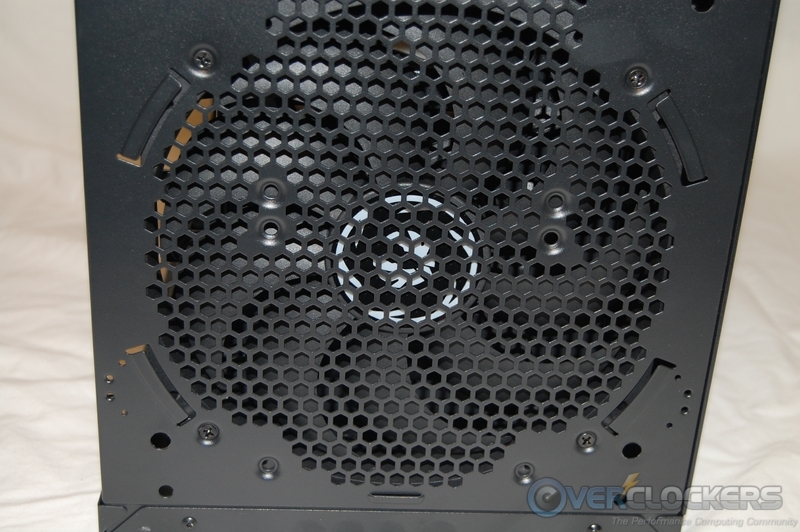 No, your eyes are not playing tricks on you; should you decide to put a 120 mm fan in the upper location, you will have to use the top two holes in the punch-out plate. 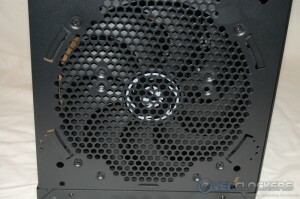 If you look closely, you can see the ventilation holes in the bottom three punch-out plates match a 120 mm fan. Call me old school, but I have my doubts about the sturdiness of using punch-out plates to secure a fan, not to mention the possibility of a radiator. 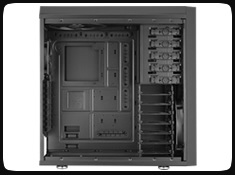 Looking at a full body picture of the interior, we see that the all black interior has a plethora of cable management options. 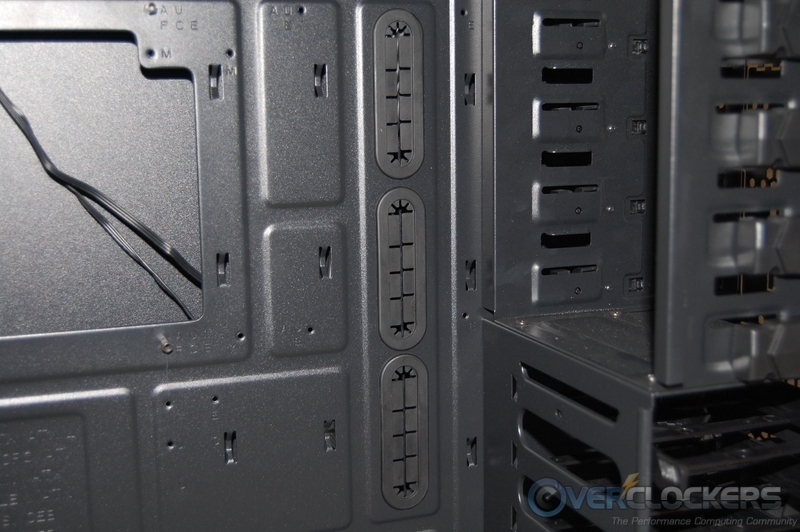 There are three horizontal cable management holes at the top, three more vertical holes down the right side, and another horizontal hole at the bottom of the motherboard tray. 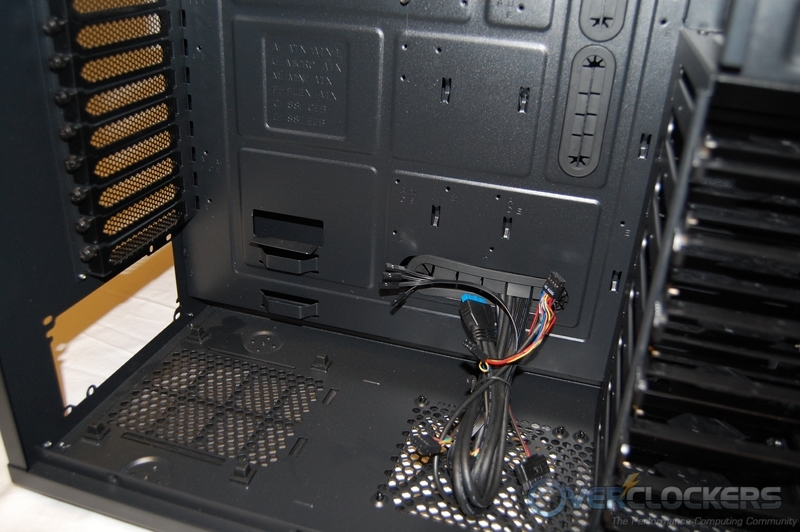 There is another cable management hole that does not have a rubber grommet located just above the PSU mounting area. 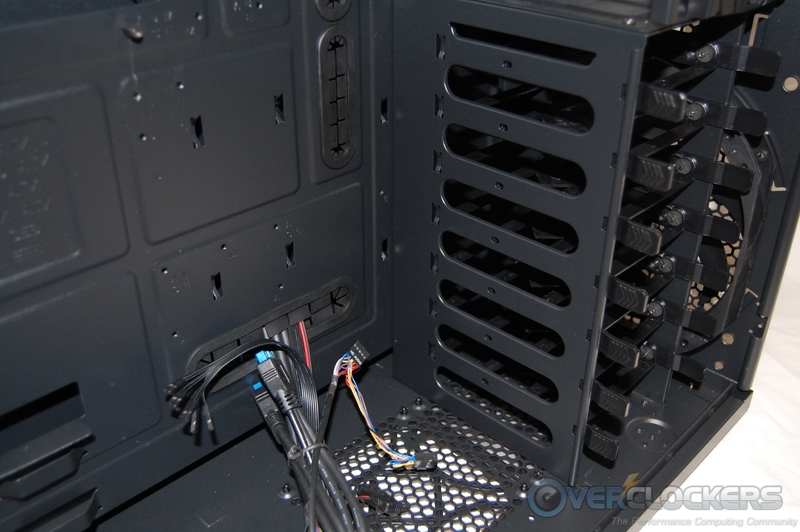 A hole in this particular area is hard to find in a case at any price and comes in handy when routing front panel cables or fan wiring. 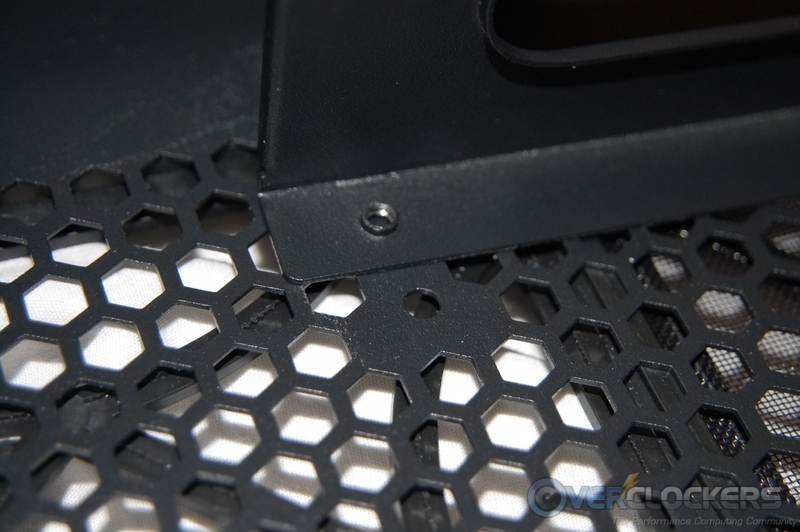 A large hole is cut in the motherboard tray to allow access to a CPU cooler’s retention apparatus; a big time saver when needed. 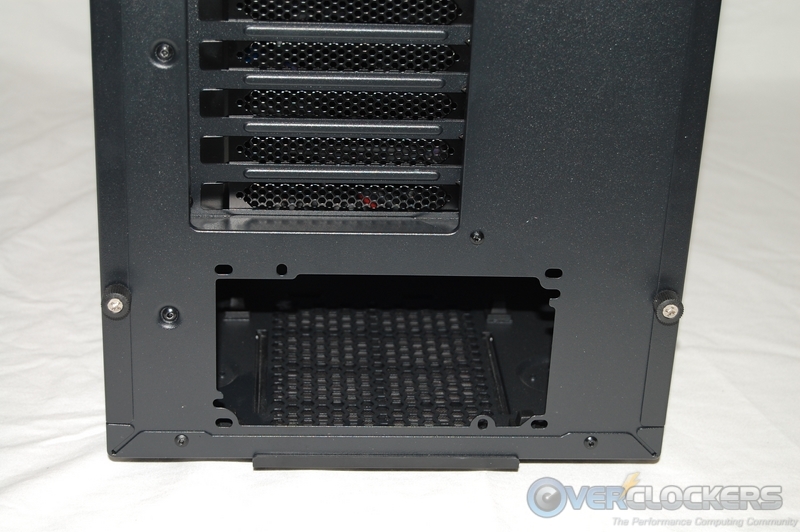 As mentioned earlier, the bottom area has a filter for the PSU, four small rubber feet to rest the PSU on, and the ability to add a couple of 120 mm fans. 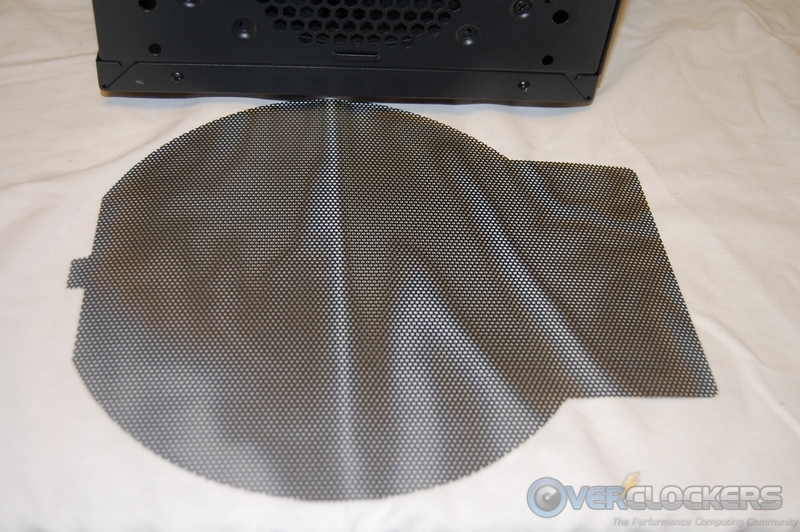 Each of the additional 120 mm fans should be protected by a filter; if you are a bit luckier than I was, and it’s actually there. 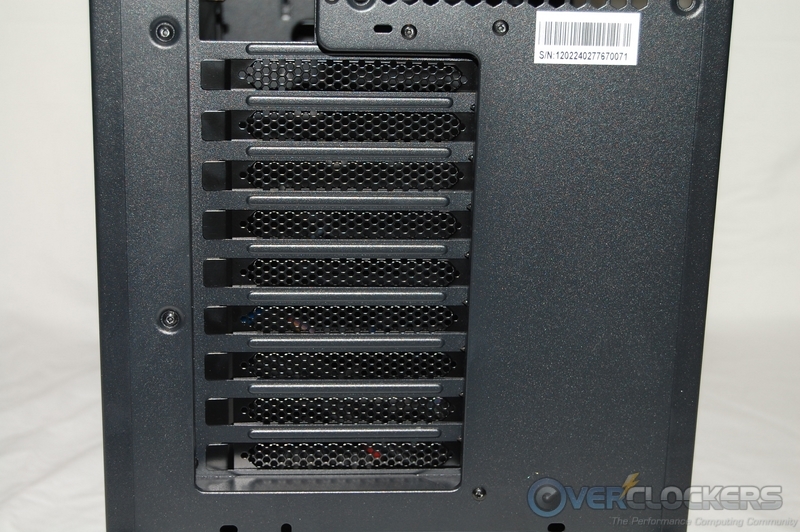 I question the option of having the 120 mm fan opening closest to the front of the chassis because if you install a fan there, you can no longer use the hard drive cage. 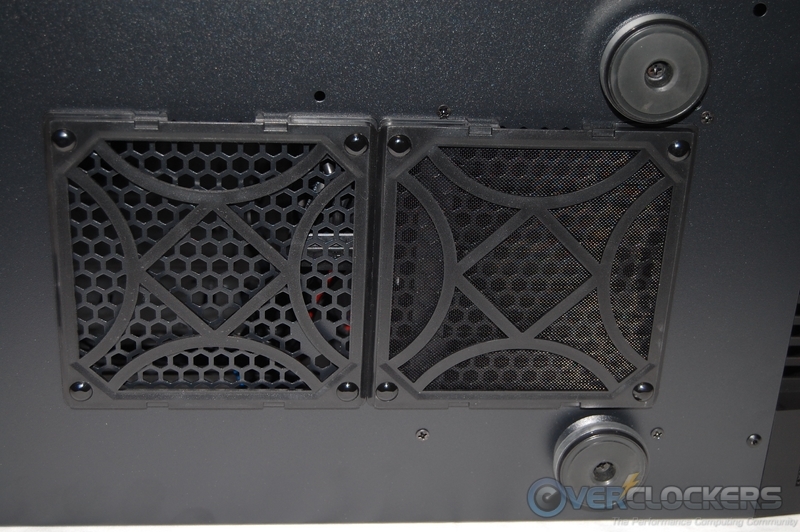 Even if your plan is to mount a radiator up front, you still won’t be able to mount a fan because there is not enough clearance between the front of the case and the two forward most fan mounting holes. I seriously doubt anyone would want to sacrifice an entire hard drive cage just to install a fan there. In all reality, that’s about all you can do with it. Moving upward along the inside rear of the Shinobi XL you can see the nine PCI expansion slot covers, all of which are held in place with black thumb screws. 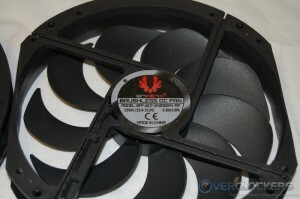 An included 120 mm exhaust fan is also located here and has a 3-Pin power connector. 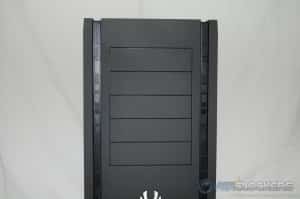 Looking up at the bottom of the top panel there is an included 230 mm fan, and a provisions made for another. 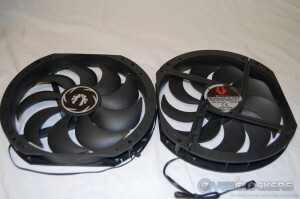 Another option is to remove the included 230 mm fan and install three 120 mm fans, if desired. 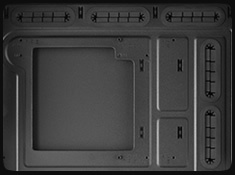 There is a maximum of 80 mm available space between the inside of the top panel and the edge of the motherboard. This is a major problem if you plan to use a 50 or 60 mm thick radiator with 25 mm thick fans attached to it. 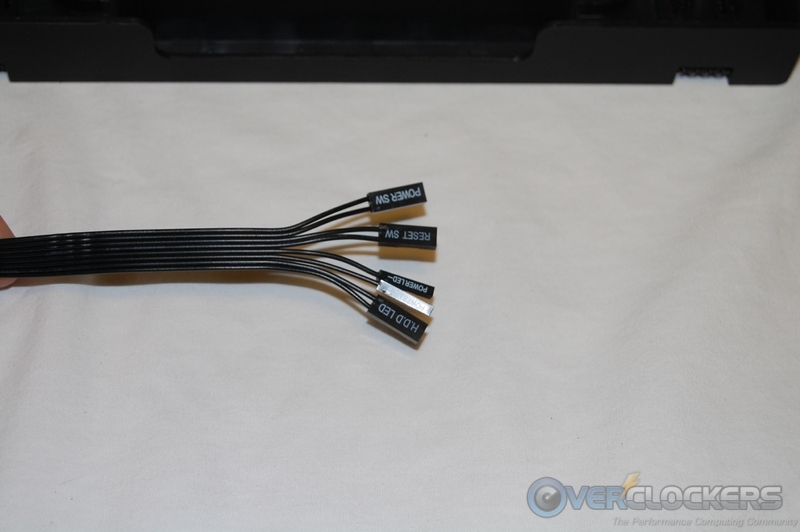 Simple math tells us that we will run into clearance issues rather quickly, depending on the location of such things as the 8-Pin CPU power connector, fan headers, CPU cooler size, etc. 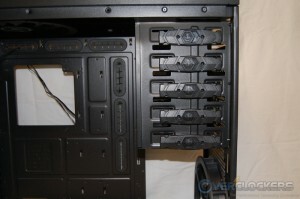 You may be asking “why not just put the fans on top, under the removable top panel?” While this is a novel idea, it will not work; because, the top panel has two support bars that will hit the fans and prevent you from getting the top panel back on. 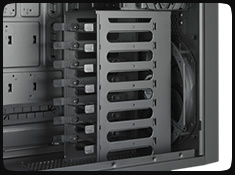 You can forget about using 38 mm thick fans on a radiator in this location, unless you decide on one of the ultra-thin radiator options. The way I see it, you have two options if you want to use the underside of the top deck for a radiator. 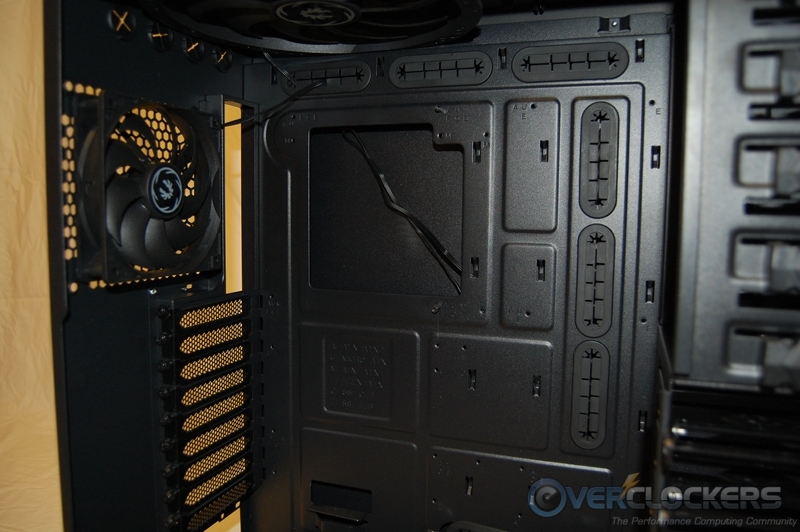 First, check the layout of your motherboard carefully to make sure you have enough clearance for a 60 mm radiator and the additional 25 mm for the fans. Secondly, and probably the one that makes the most sense, is to sacrifice a few degrees of cooling performance and look for one of the thinner radiators available on the market. 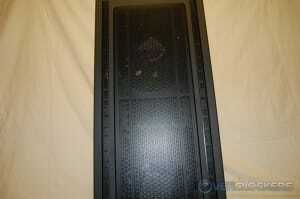 As long as we are talking about the top panel, I went ahead and took it off to show you what’s underneath. 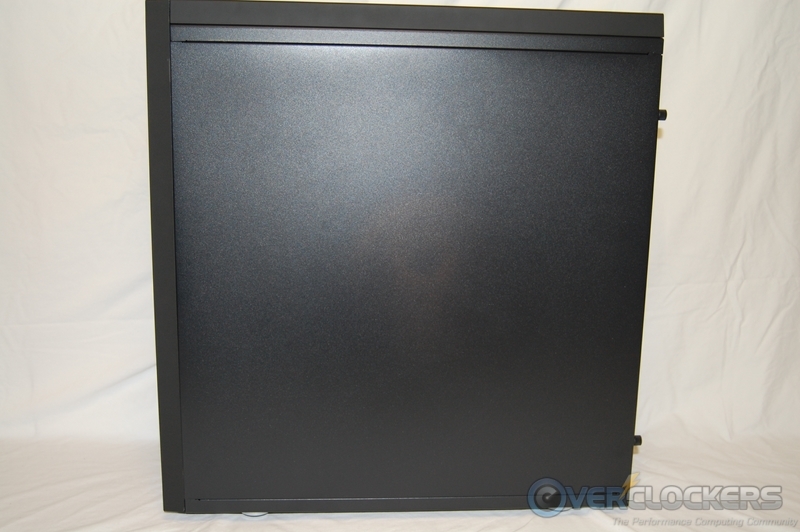 Unlike the front panel, the top is completely meshed allowing for an almost unobstructed airflow to the 230 mm fan. 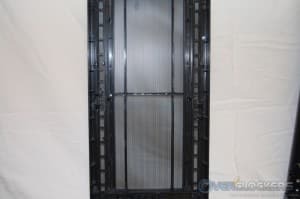 I say almost because the air must flow through the mesh built into the removable top panel, and again through another meshed area in the frame. 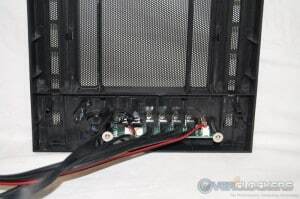 Here is a closer look at the internal electrical connections built into the top panel; everything was found to be well connected and secured with a dab of glue. A couple of unique things are incorporated in the front panel wiring; the best of which is the two USB 3.0 motherboard cables. These cables also have a USB 2.0 lead built in to them. 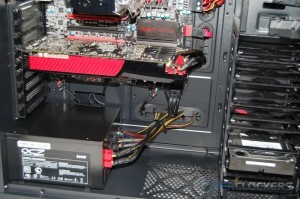 This is good to see because most current motherboards only have one USB 3.0 header. The additional cable can be plugged into a USB 2.0 motherboard header and be used that way. 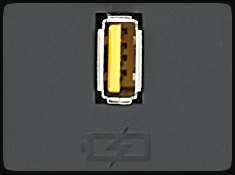 The second unique wiring item is the “USB Supercharge” power cable. Instead of using the traditional 4-Pin Molex connection, BitFenix opted to use a SATA power lead. The remainder of the front panel wiring is pretty standard fare for most cases. 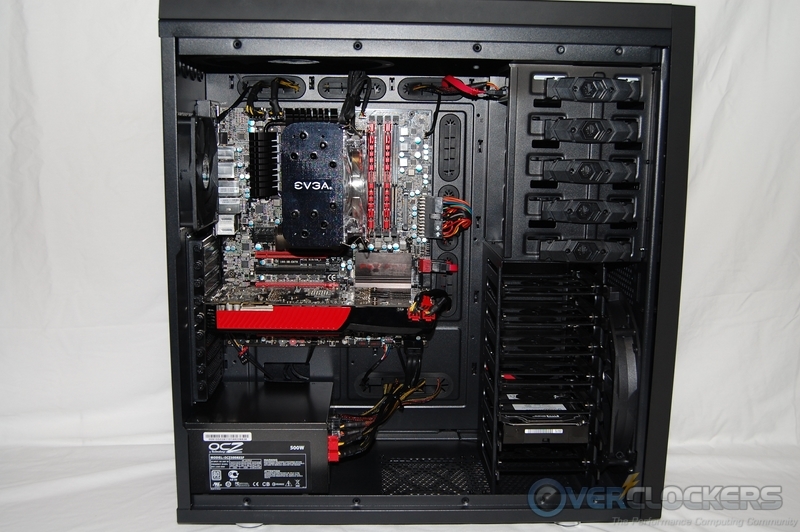 As long as we are looking at electrical parts and components, now would be a good time to have a closer look at the three included fans. 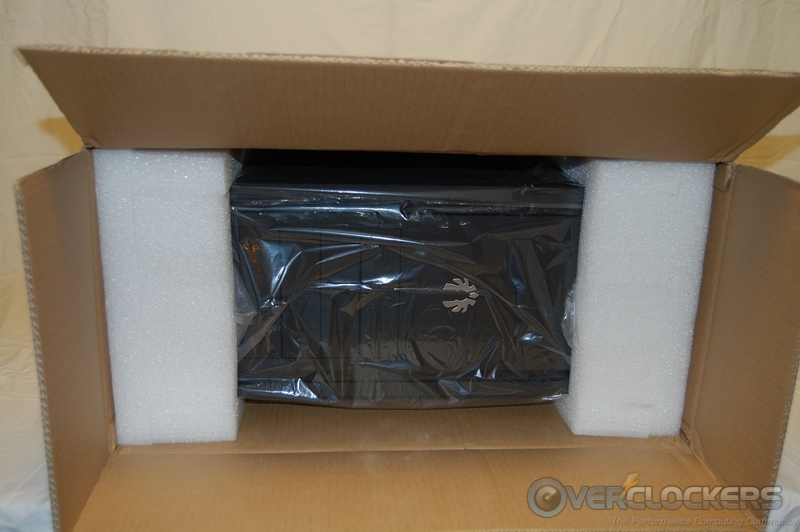 Both the front intake and top exhaust fans are BitFenix model number BFF-SCF-23030KK-RP. These fans operate at 900 RPM and provide 97.8 CFM. The 120 mm rear exhaust fan is also branded BitFenix and has model number BFF-SCF-12025KK-RP assigned to it. 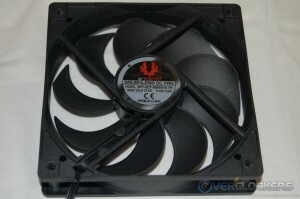 The fan runs at 1000 RPM and has a CFM rating of 43.5. The 5.25″ drive bay area features a tool-less design by way of locking latches on both sides of the bay. 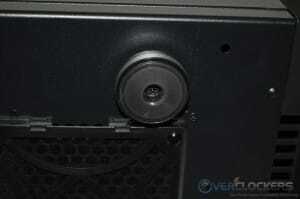 To use the locking latches, simply slide the drive in place, and move the center portion of the latch to the middle. 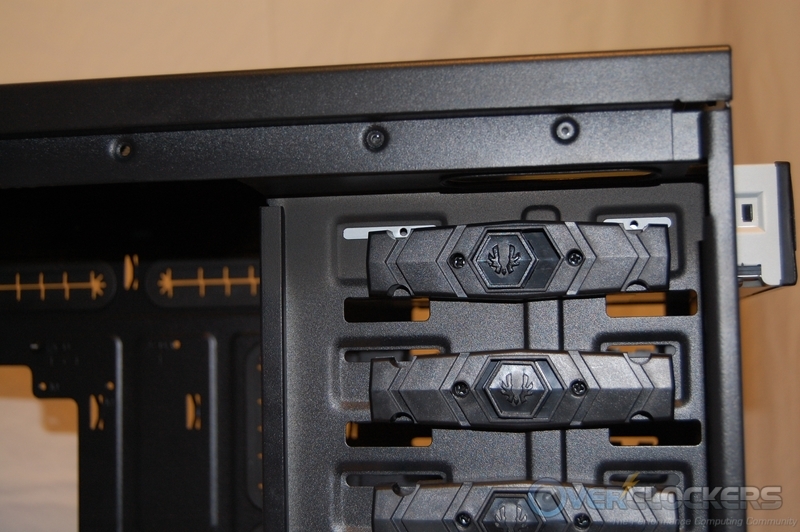 At this point, the center portion of the latch acts like a spring loaded push button, which you press in and slide either forward or backwards to lock the drive down. 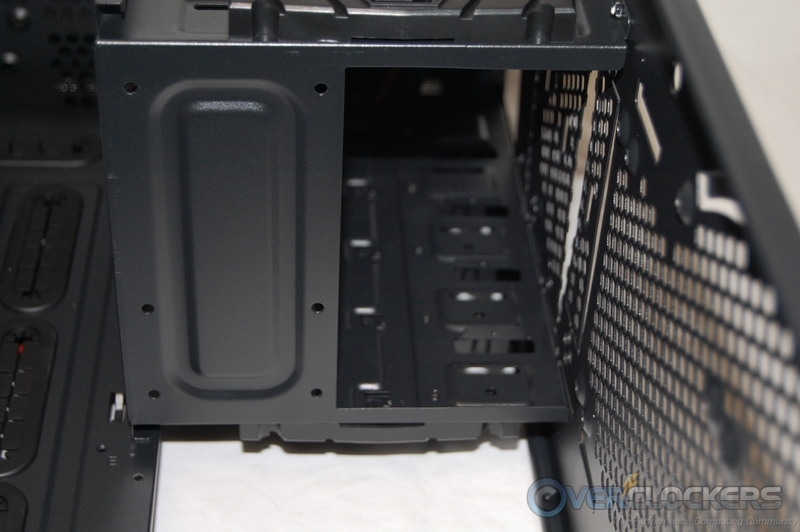 The inside view gives you another look at the fan mount area incorporated into the punch-out plates. 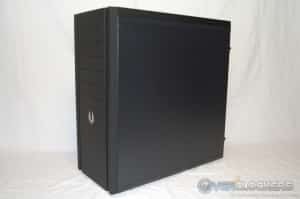 The removable 3.5″ hard drive rack supports up to seven drives via the slide-out trays. 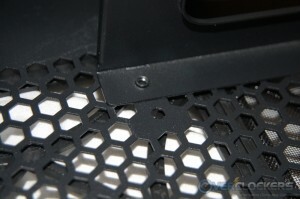 The rubber grommets around each of the alignment pins are slotted to mate with the holes in the side of the tray. 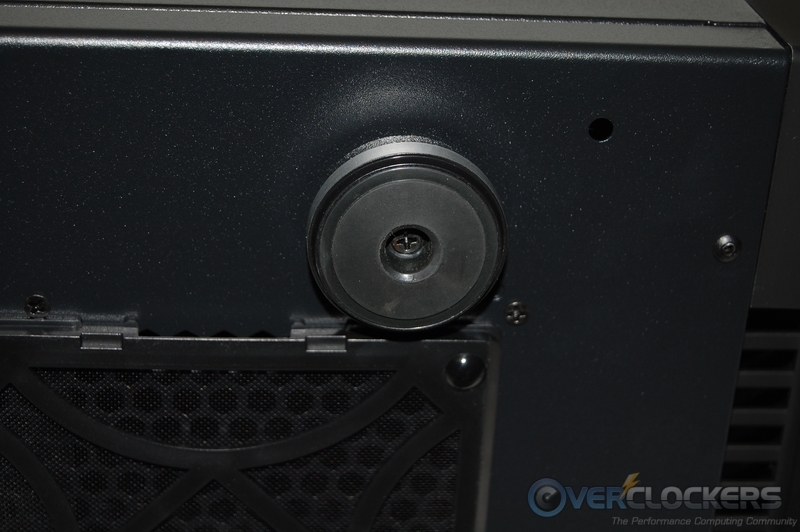 I think the intended method of installation here is to first attach the pins and rubber washers to the drive, set the drive in the tray, and finally, slide the drive back to engage the rubber washers to the tray. I took the easy way out and left the pins and washers in the tray. Then I just installed the drive by flexing the tray until the pins lined up to the hard drive; seemed a lot easier that way! 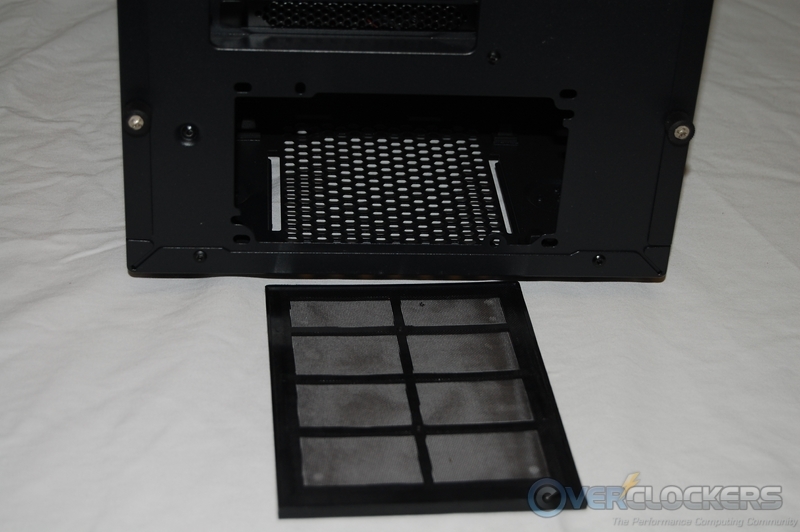 Worth noting is that all the trays have holes to accommodate 2.5″ drive installation using the holes at the bottom of the drive. 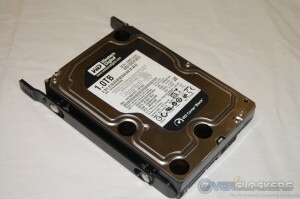 To remove the hard drive cage you must remove eleven screws, four each at the top and bottom, and three more at the back of the cage. 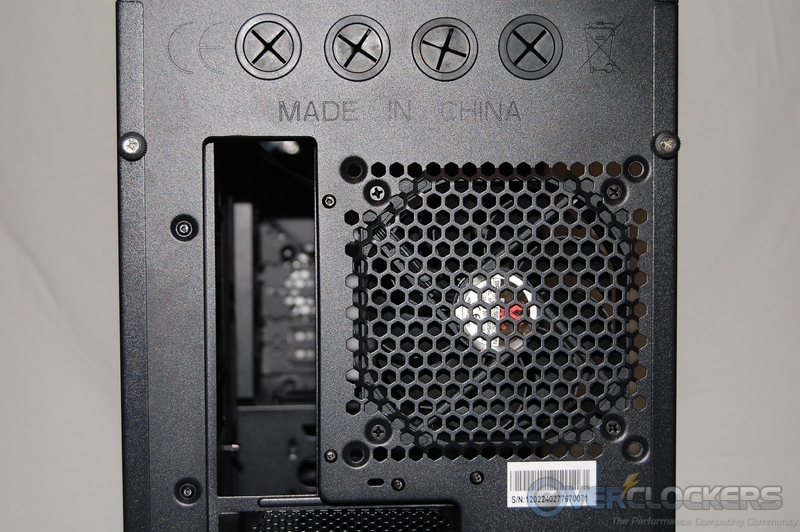 Once the cage has been removed, you can get a clearer picture of the forward-most optional 120 mm fan location. 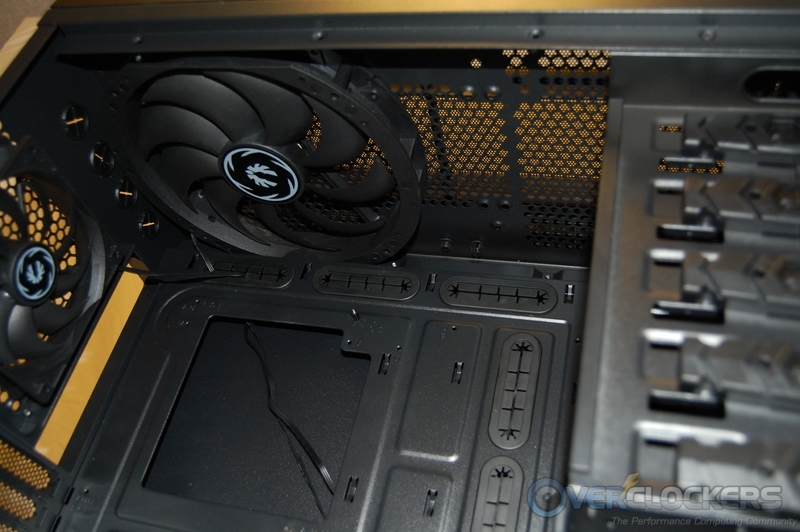 As mentioned earlier, if you install a fan there, you lose the ability to keep the hard drive cage installed. 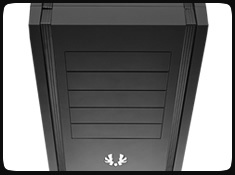 The 3.5″ HDD cage can be rotated 90 degrees clockwise, but in doing so you will lose the ability to install a fan in both of the 120 mm locations. 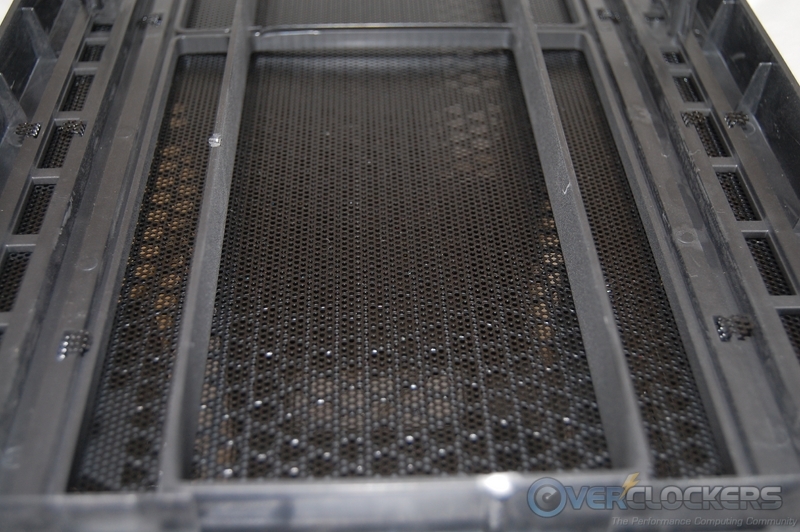 If you decide to rotate the cage, you will have to remove the filters to get at the needed screw hole locations. 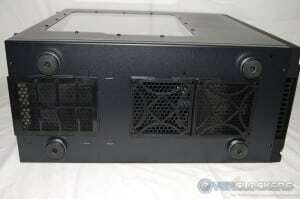 If you have ideas of installing a radiator at the front of this case, you have some hard decisions to make. The biggest hindrance to installing a radiator in this area is the small opening at the bottom of the 5.25 drive bay. 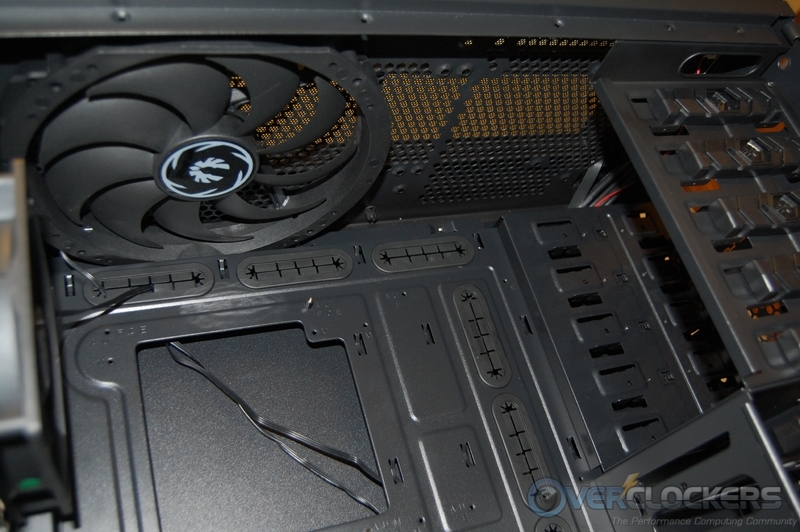 The opening again limits you to 80 mm for the combined radiator and fan thickness. 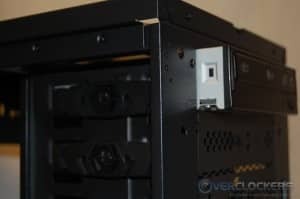 To compound the problem, if you desire a 360 mm radiator in this location, it will limit you to having only the very top 5.25″ drive bay as usable. 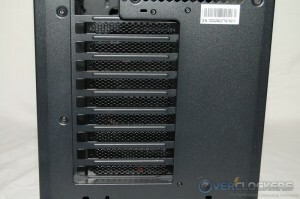 Also, the front filter will not cover the top fan that gets attached to the drive bay punch-out plates. So, with a 360 mm radiator in this location, you are now without a hard drive cage and filtration for the upper fan; and you just have one 5.25″ drive bay at your disposal. 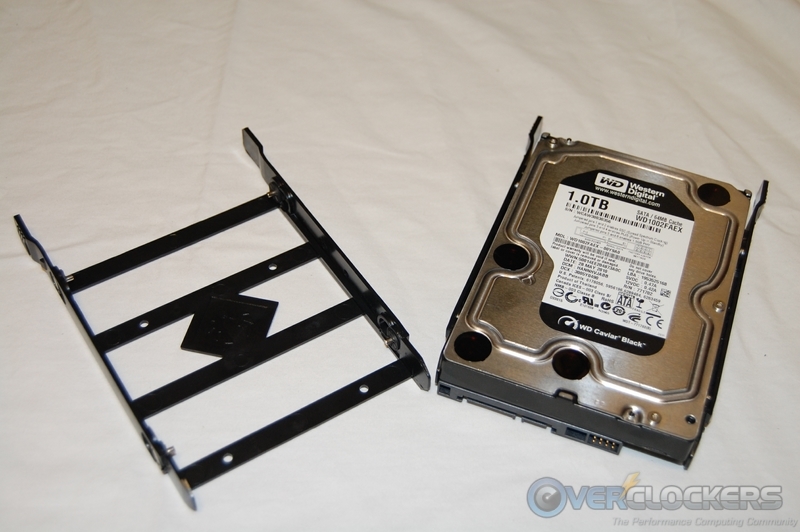 I guess if one optical drive is all you need, and you use a SSD as your hard drive, you could make this work by tucking the SSD away somewhere else. Even so, this is probably not the best arrangement. 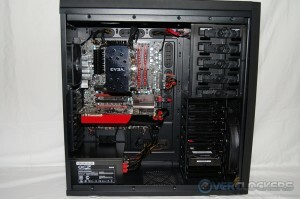 The better choice might be to use a 240 mm radiator in this location. Be advised however, that even a 240 mm radiator will reach into the small opening at the bottom of the 5.25″ drive cage. Again, think thin radiator here! Wrapping up the interior tour of the Shinobi XL is a quick look at the right side of the case, with the panel removed. 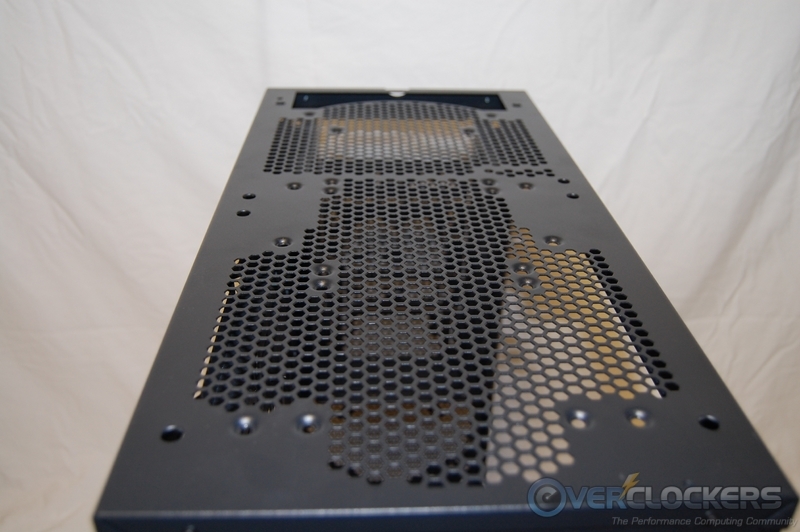 From this vantage point, you can see the right side 5.25″ drive bay locking latches, the seven cable routing holes that are protected with rubber grommets, and the additional hole above the PSU mounting area. 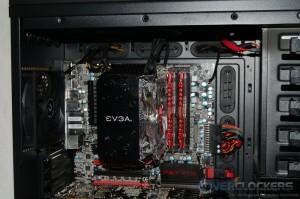 While certainly not the biggest I have seen, the hole to access the CPU cooler is more than adequate in size. 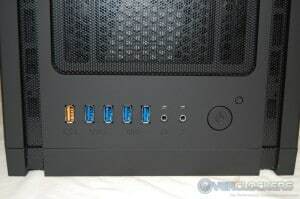 If you have read any of my past case reviews, either here (cough, cough) or at the other site I write for, then you know one of my pet peeves is a lack of distance between the back of the motherboard tray and the right side panel. 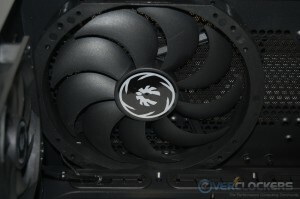 This is one area that BitFenix got right with the Shinobi XL. I measured a full 1-1/4″ between the motherboard tray and the panel; awesome job there! To further compliment the the cable management at the right side of the case are no less than 16 places to affix a wire tie. 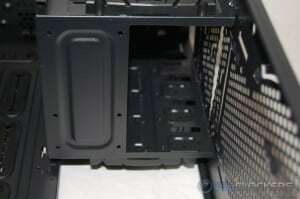 Unfortunately, they are all located from the center area forward leaving nothing to tie to as you route cables behind the motherboard tray and towards the rear of the case. I used the following components to quickly throw a system together inside the Shinobi XL. After installing all the parts, I immediately went to the back of the motherboard tray to tidy things up a bit. 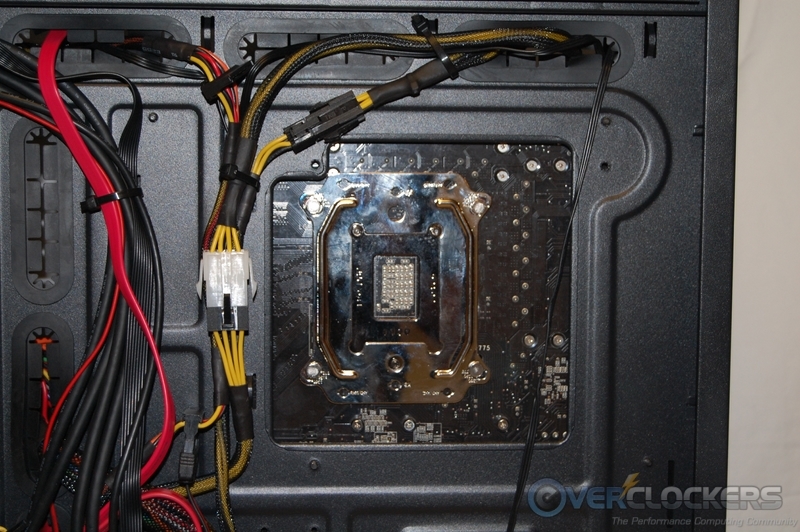 As I mentioned earlier the CPU cooler access hole is not the largest I have seen, but as you can see in the picture below it worked fine for this install. 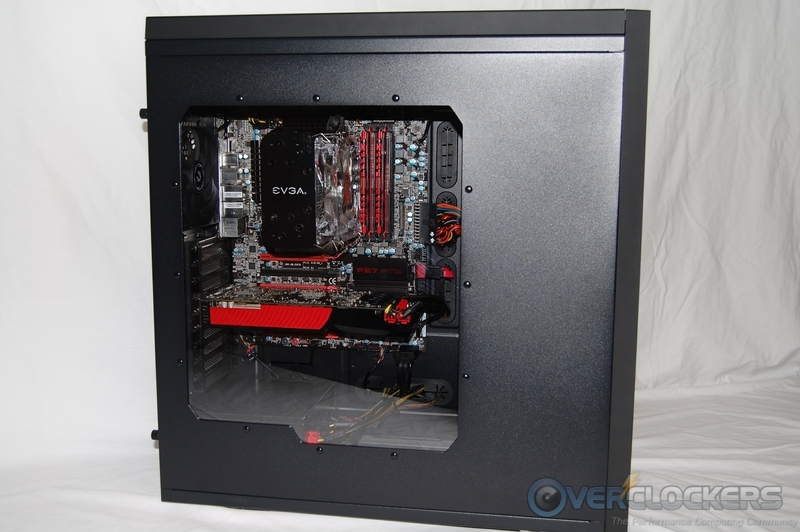 The right side panel easily fit back on due to the enormous amount of room available there. 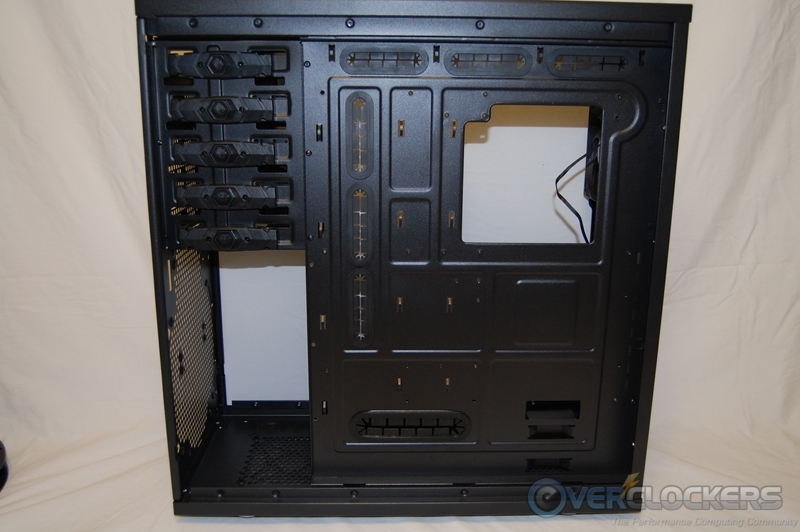 Here are more pictures after assembly with the left side panel off. 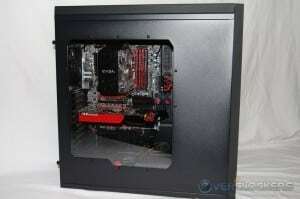 And finally, with the windowed left side panel installed. 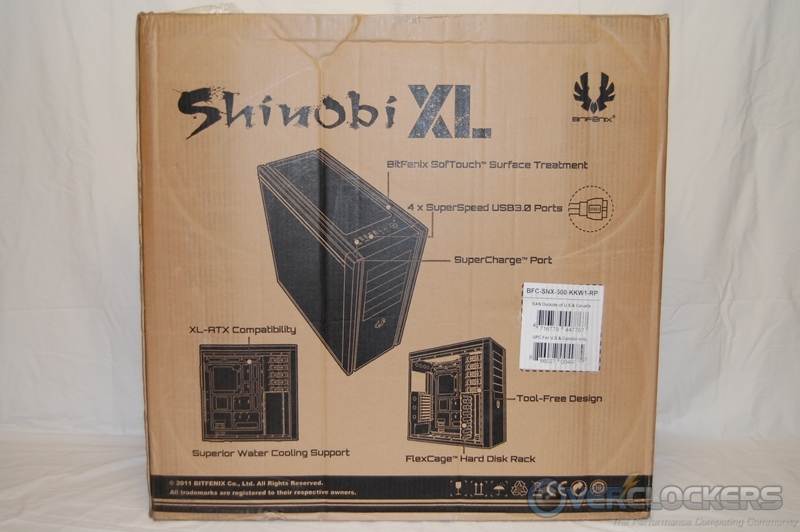 Obviously touted and marketed toward the water cooling enthusiast, I’m afraid the Shinobi XL falls short in some key areas. 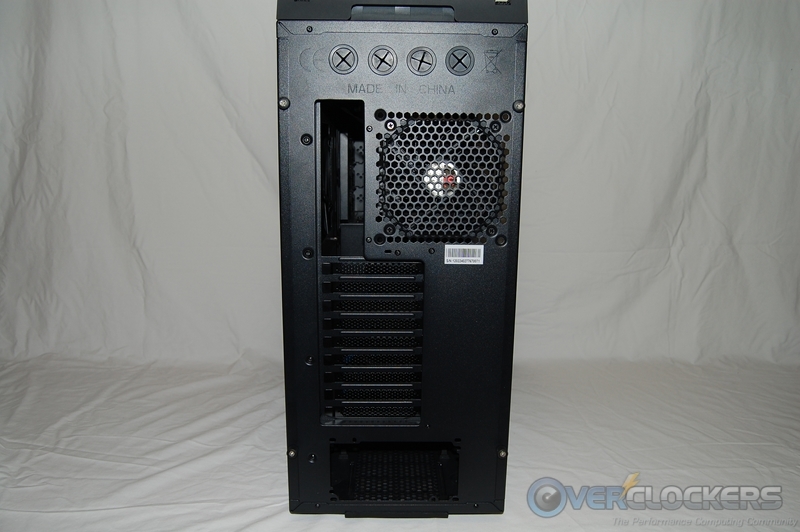 The reference BitFenix makes to the likeness of the original Shinobi is really a misnomer because in all reality, the Shinobi XL has an interior and frame design almost identical to the Colossus case. 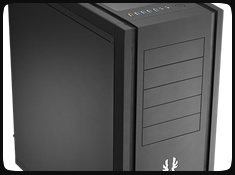 The difference between the two that is most important, in my opinion, is the case height. 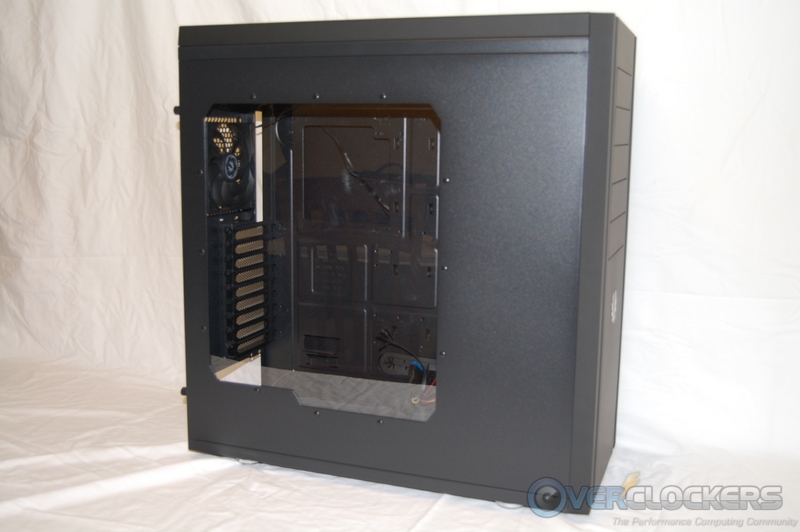 The Shinobi XL expanded the height by 12 mm making it XL-ATX compatible, but also had to add two PCI expansion slots, which are roughly 24 mm. The missing 12 mm had to come from somewhere, and unfortunately, I believe it came at the expense of the top deck radiator space. 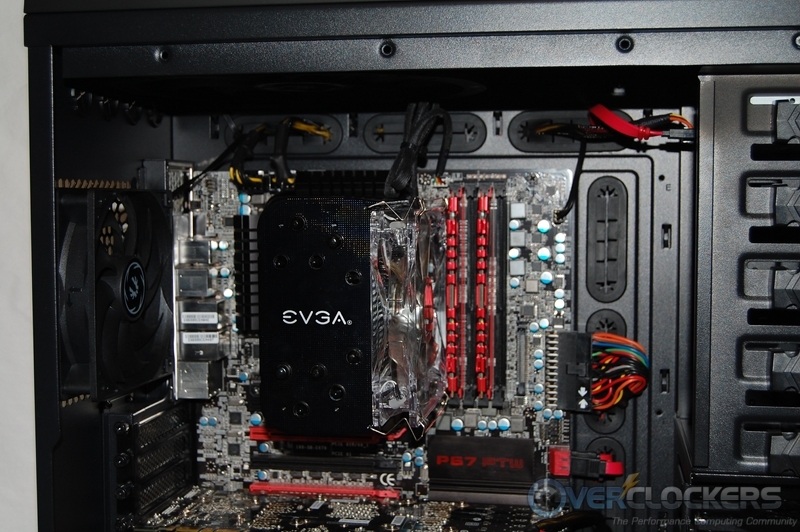 Using water cooling only allows for thinner radiators. 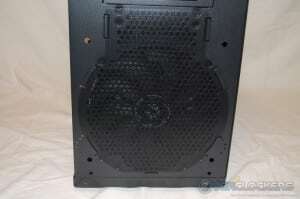 Install an optional 120 mm fan in the bottom front location and lose the ability to use the HDD cage. 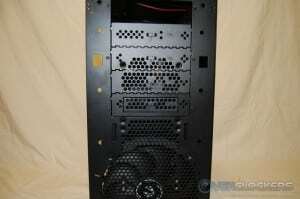 Install a radiator in the front and lose the ability to use the HDD cage. 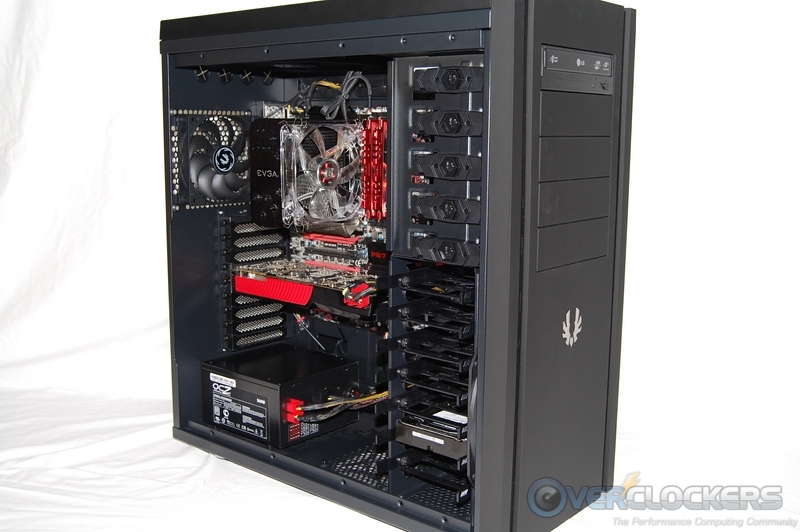 Use a 360 mm Radiator in the front and lose usage of all but the top 5.25″ bay. 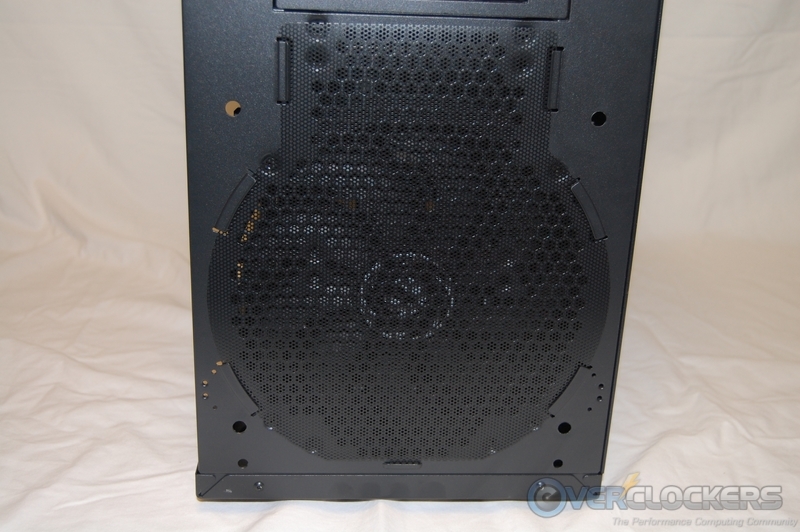 Use a 360 mm Radiator in the front and the filter doesn’t cover all the fans. Rotate the HDD cage 90 degrees and lose the ability to install a 120 mm fan in either of the optional bottom locations. 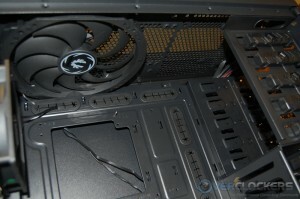 Installation of fans on the outside of the upper deck results in the inability to reinstall the top panel. Personally, I like options, not restrictions. Speaking of restrictions, let’s talk about the front panel design and the two 1/2 inch wide vent strips. 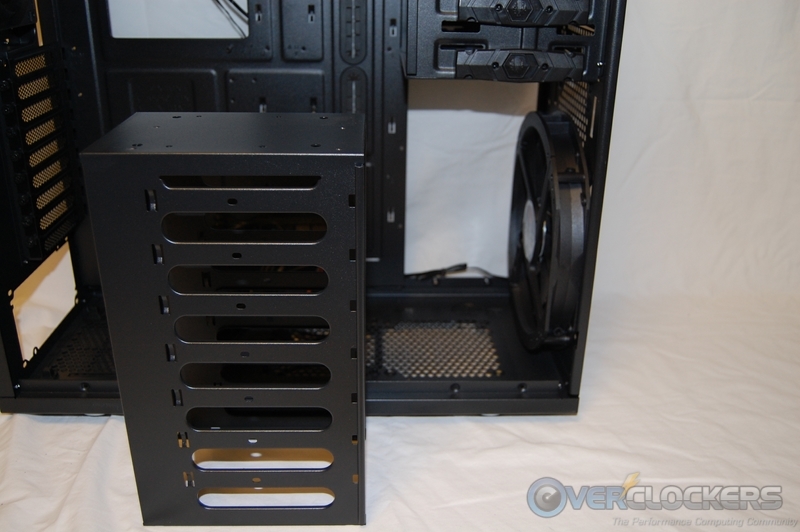 I am reminded of the Maroon 5 song “Harder to Breathe” when I think about a front mounted 360 mm radiator and the three fans attached to it sucking for all they are worth in an attempt to get enough airflow to the radiator through those 1/2 in wide vent strips. Try as they may, I doubt they will be able to get enough air to maximize the effectiveness of the radiator. 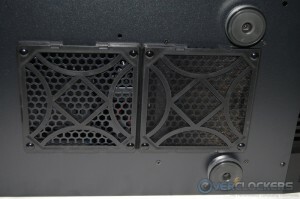 While not nearly as severe as the front panel design, the two mesh areas at the top of the case will also hinder airflow to a radiator located there. 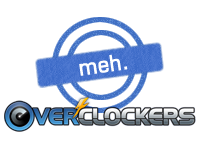 There are several features that work well and were nice to see. 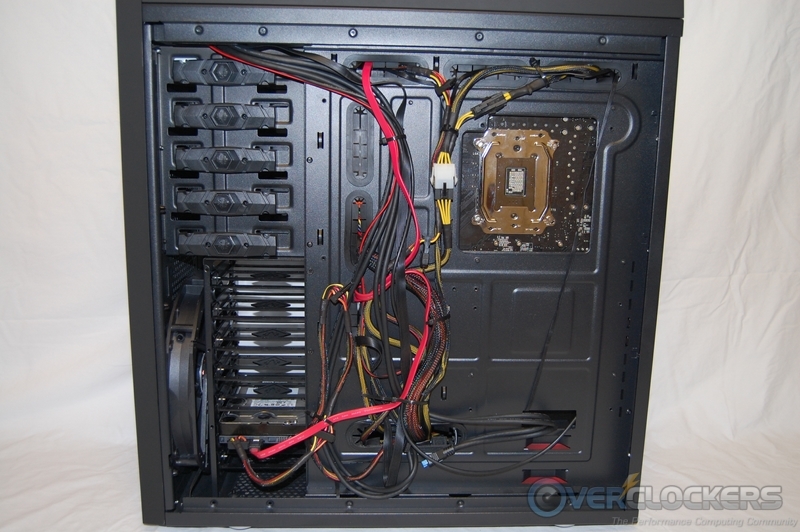 For me, the best of all was the cable management solution. 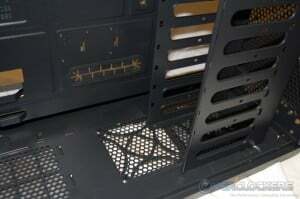 The abundance of holes to route wires to the back of the motherboard tray and the huge amount of available room once you get them there is nothing short of terrific. The Supercharge USB port is something everyone with mobile devices will appreciate, especially as these devices become more and more popular. 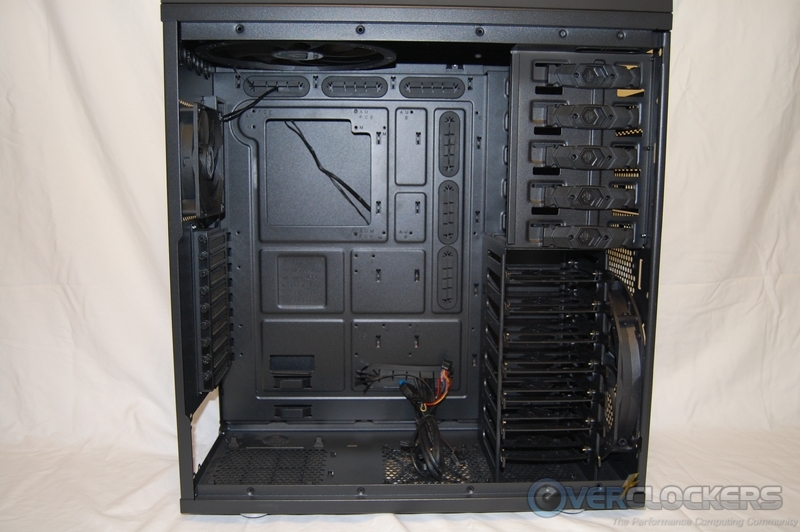 For the air cooling crowd, building a sharp looking system should be easily accomplished; and the ability to add additional or bigger fans is a nice feature as well. So where does this leave us? 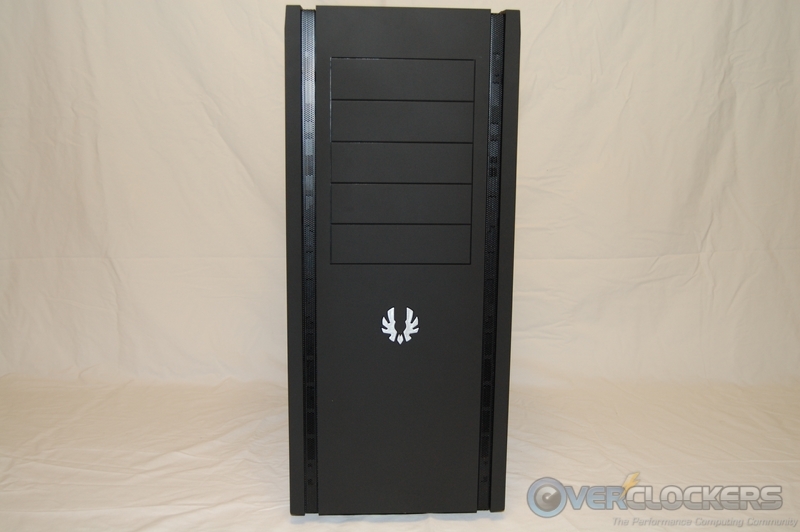 I think BitFenix tried to make this case all things to all people. In doing so, they probably ended up alienating more people than they attracted. 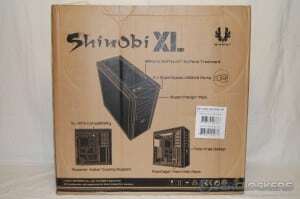 The truth is, the Shinobi XL is extremely close to being an epic case, if several design changes are implemented. 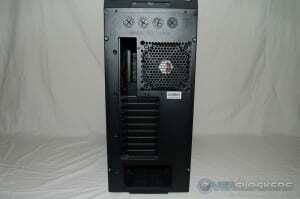 At a MSRP of roughly $160.00, the competition is pretty stiff in that price point. 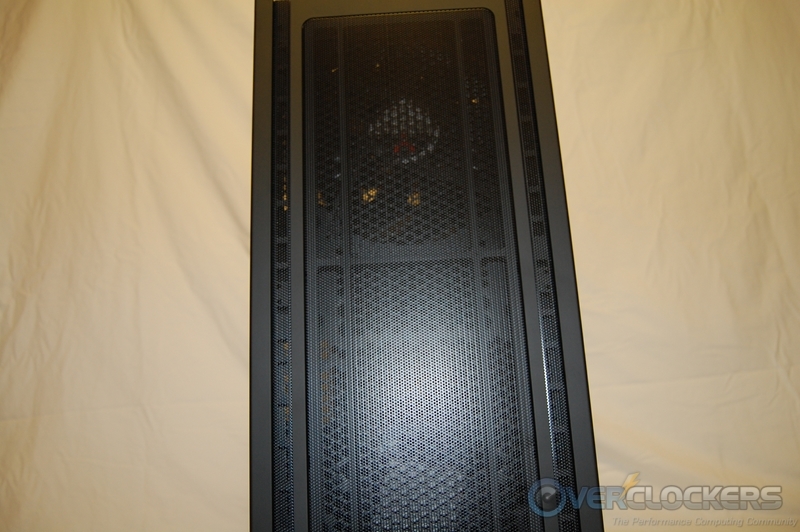 The air cooling crowd will find it a good value, but the water cooling enthusiast will more than likely look for something less restrictive. 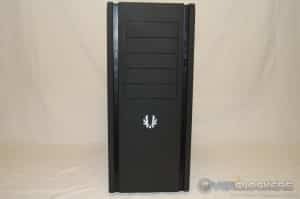 Just looking through the pictures of the review made me cringe when the top mentioned "aimed at water coolers". 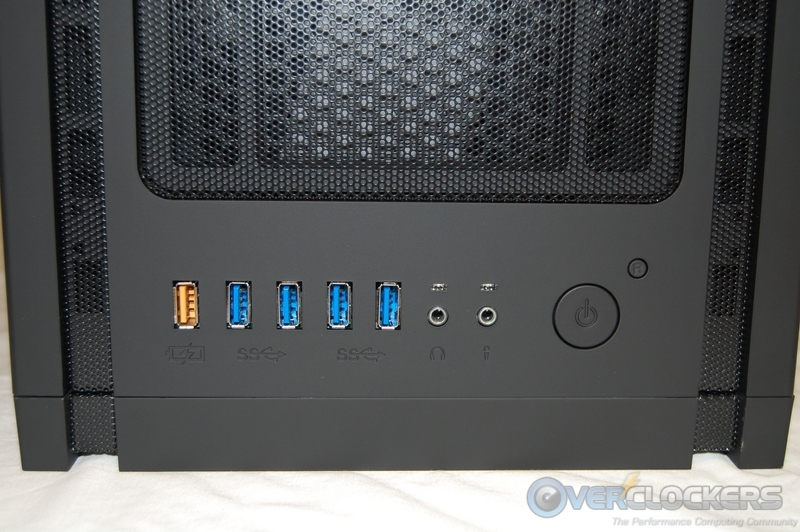 The little details make me realize how truely awesome the nzxt switch 810 really is. 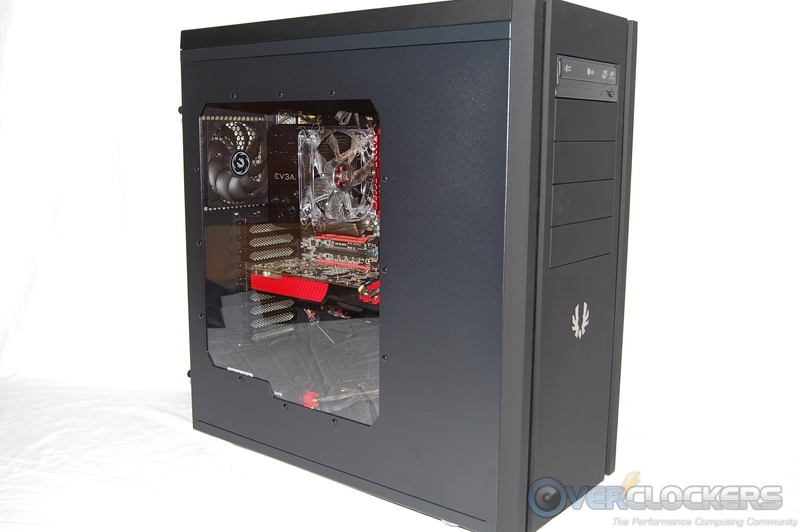 Especially at $160 in competeition with this case. Ill stick to my 1200, yeah something about that big made in china stamp on the back made me cringe regardless of the facts of life these days. And yeah, the lack of vents on the front end too, those strips just wouldn't hack it for me I think.